Increase the value of your home by fitting new gutters to ensure that rainwater drains away and provides your home with ultimate protection. 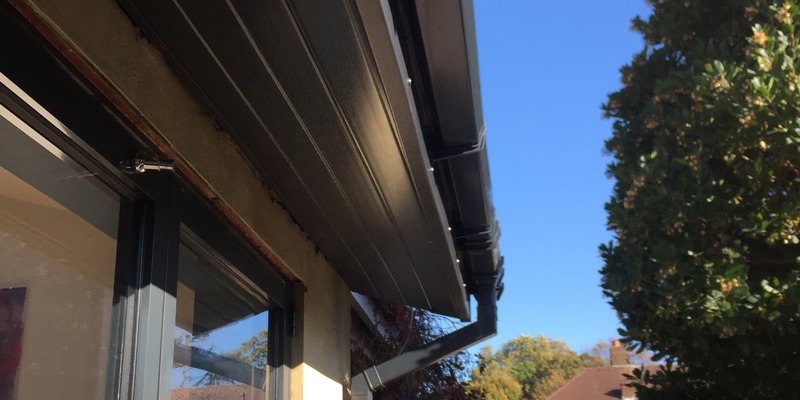 Serving all of Surrey and Berkshire, whether your property has modern or period features, we can improve the overall look as well as offering preventative measures with our gutter services and repairs. When you fail to maintain your guttering systems, this can lead to significant problems both internally and externally. Sagging gutters that are not fixed correctly to the outside of your property, or missing brackets or fixings causing the weight of the water in the gutter to sag, can result in leaking onto external walls. This then results in damp and structural issues. A Goodwill Roofing and Building Maintenance Ltd can recommend the right guttering system for your property. Fitted by our experienced tradesmen, your new system will give you many years of reliable use. As standard, we utilise high-grade UPVC gutters and downpipes that are easy to clean and weather-resistant. Our professionals can also offer aluminium, cast iron, and concrete materials if you prefer. These are available in a variety of colours and designs, which will be installed by our highly skilled and experienced team, and will increase the value of your home overall. When you get in touch with us today, we’ll arrange a suitable time for our team to come out and examine the job at hand. We can then provide you with a detailed quote. Please note that we never utilise subcontractors in any part of our service. Goodwill Roofing is a respected family run business that considers the heart of their business to be the clients. We pride ourselves on providing excellent customer service and consulting our clients every step of the way so they can make informed decisions. A prompt quote with excellent communications and good follow-up. Given the two big storms blowing through and the relative insignificance of the damage to our roof, the work was done very promptly, tidily and efficiently. Good explanations of what was proposed, found and done were given. Terrific – many thanks. Responds to requests and trustworthy. I called other roofers (not from this site) and did not get a response either by telephone or email. I came here and tried Aaron and got a quick response. He came and viewed the work. We agreed the job and the date for the work. On arriving he reviewed his previous assessment and it took less time (and cost) than expected. Having asked a more local roofer (not a Which? Recommended Trader) and getting no response, I asked Aaron (not so local) if he would call to find the cause of a damp patch. The cause was found, and as it was small he sorted it there and then for no charge. Aaron has restored my faith in local (and not so local) tradespeople.